Back when I was spending my year abroad in Italy I was living in the heart of Emilia Romagna, smack bang in the middle of piadina territory. Piadine were one of the first local foods my flatmates took me out to try. We went to a little cafe, with a handful plastic tables and chairs under umbrellas, set in a large park all of 10 metres from our building. The cafe (or piadinaria) was a popular little place; all they sold were freshly made piadine and crescioni. 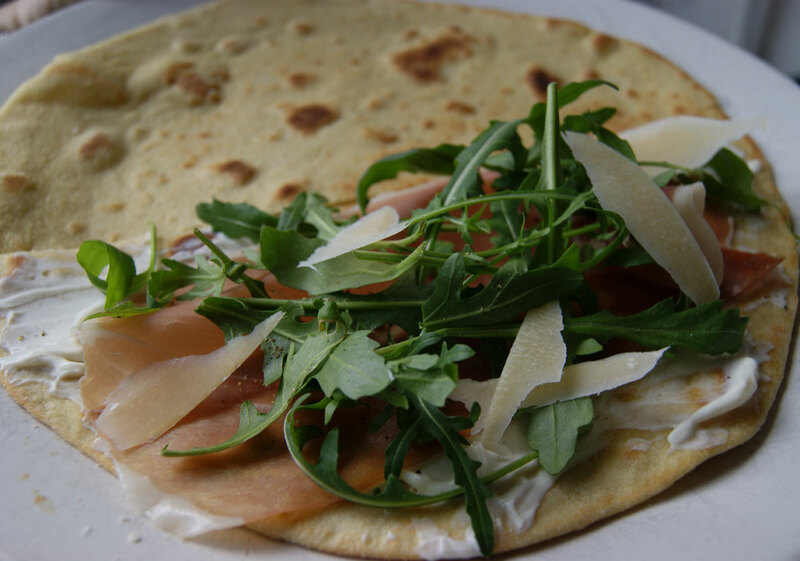 Piadine are the Italian version of a tortilla, a simple flatbread cooked until just crisp, that is traditionally served as a sandwich filled with cheese or prosciutto. Crescioni are more like a calzone: before cooking the piadina dough you fill it with tomato and mozzarella (or my favourite roasted pumpkin, pancetta and asagio) and fold it over before toasting it in a hot pan to cook the dough and heat the filling. Visits to the piadinaria nel parco became a regular occurrence and before heading downstairs to the cafe we’d peep out the window to make sure there was a free table, squillo (Italian for drop call) our friends and rush over for lunch. It became a tradition that every Sunday we would meet up for “piadine in the park” and then go for a gelato or a stroll to try and spot the resident turtles and coypu and watch the hundreds of near-tame rabbits frolicking. I have such fond memories of our Sundays in the park that it took me a long time to muster the courage to recreate piadine back home in the UK in case I spoiled them. I knew there was no way I’d be able to get hold of any squaquarone which is the traditional cheese served in piadine; it’s a soft cheese that tastes a little like mozzarella but with a more acidic tang, and I’ve never found another cheese with a similar texture which is something of a cross between cottage cheese and mozzarella but at the same time nothing like either of them. For now Philli would have to do. Fortunately my other favourite fillings are widely available – prosciutto crudo, rocket and shards of grana padano. 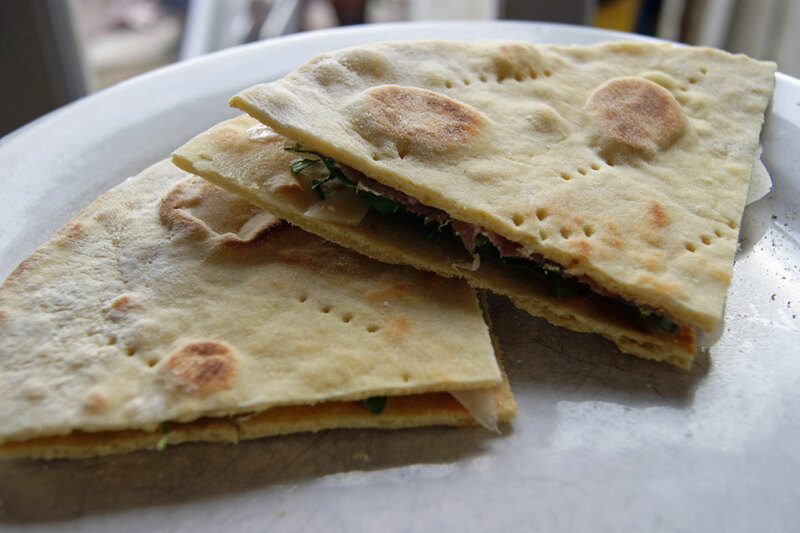 It turns out that piadine are pretty easy to make, no wonder they’re such a popular fast food! 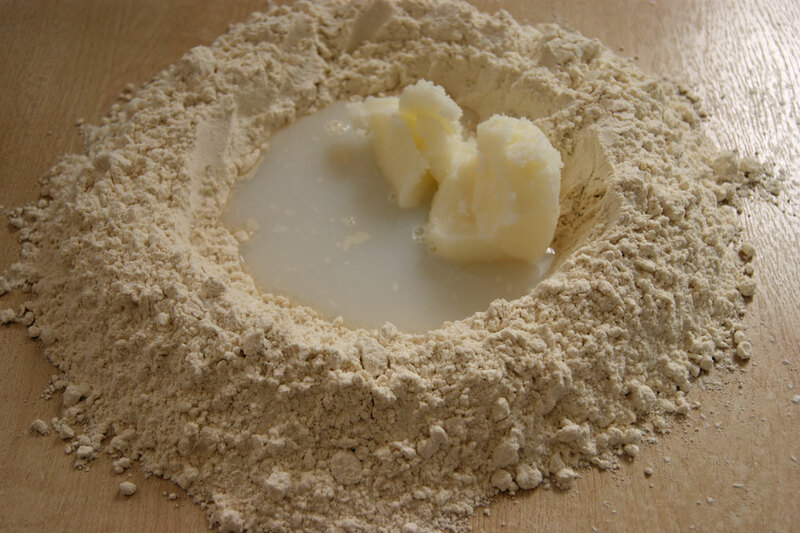 The dough is a simple mix of flour, baking powder, fat, salt and water; most recipes call for lard and I was tempted to sub it for olive oil but the lard is what gives these breads their flavour and texture so in it went. They’re best eaten fresh while still warm but can be reheated in a hot pan if you decide to make extras. Once your piadina is toasty and golden brown on both sides add your fillings and sandwich with another warm piadina, cut into quarters and enjoy with a cold Peroni! Mix the flour, baking soda and salt. Make a well in the middle and add the lard and most of the water. Mix with your fingers to form a dough adding more water if necessary. Knead the dough until smooth, about 10 minutes, cover and leave to rest for half and hour. Divide the dough into 6 equal pieces and roll out into a thin circle about 25cm in diameter. Trim the edges if you’re so inclined, I don’t as I hate to waste any dough. Heat a non-stick frying pan over a medium heat, place your first circle of dough in the pan and cook for one or two minutes on each side. If bubbles appear prick the piadina with a fork. 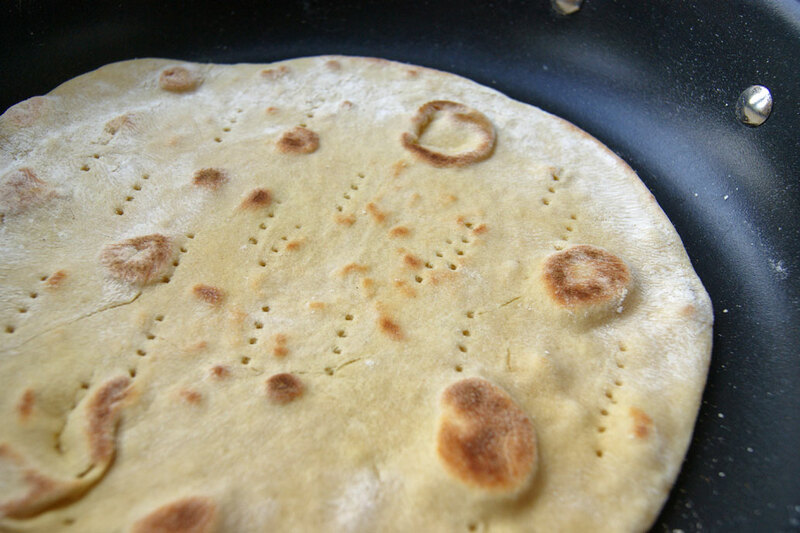 Once the first side is golden brown flip the piadina and cook the other side. Repeat with the remaining piadine. Fill with whatever takes your fancy.